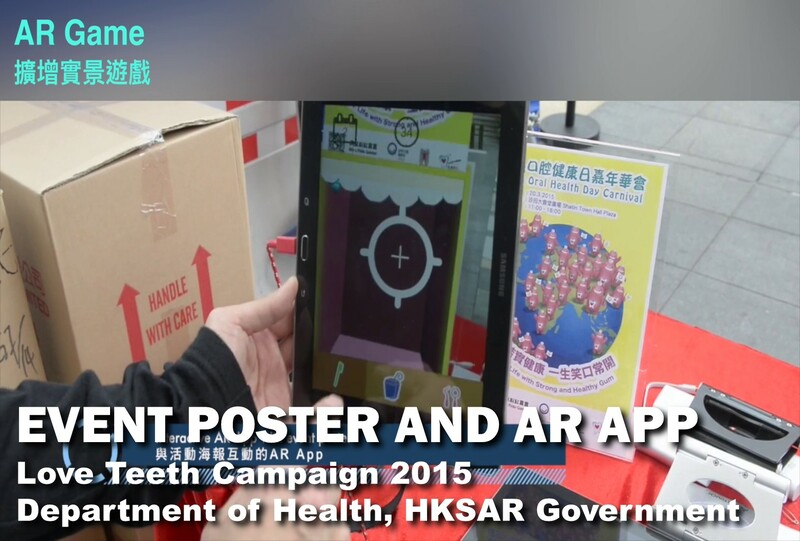 Another feature activity in the Love Teeth Campaign 2015 is an AR Game App that can play using Love Teeth Campaign Poster to kick start. Mobile app can enable the camera to recognize the poster of the event and then a virtual world will be opened that will show the cartoon mouth with many bugs. Player can use the target to shoot the bugs in order to win the game. Visitors can play different area in the exhibition where has poster to enjoy the challenge. A gift can be received after visitors completed the game. Love Teeth Campaign 2015 aims to promote the theme “Good oral health can only be achieved by good oral self-care together with appropriate use of professional oral care”. It is organized by the Oral Health Education Unit, the Department of Health. An event with the theme “Caring Oral Health Months” was launched to promote the adults to show their care and love to their family members by bringing them to visit the dentists during the Caring Oral Health Months.